When you visit our showroom, often times you will be treated to a tour of the store… it’s a visual feast for the eyes. From pre-owned Rolex watches to fine Art Deco jewels, there is something for everyone. Perhaps one of the most popular stops on the tour is the Victorian case featuring a vast array of late 19th century mourning jewelry. Based on the broad range of reactions to some of the pieces available, we’ve dubbed it “creepy and cool”. This beauty from Joe’s Special Box would definitely fall into the cool category, not to mention beautiful. 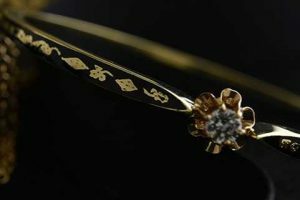 Entirely constructed from 14 karat yellow gold, this elegant bangle is as lovely as it is wearable. 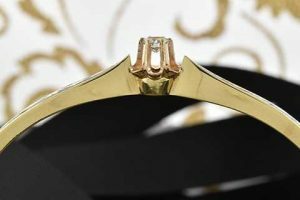 Winking from the center of the fluted buttercup setting is a .20 carat diamond. It adds a hint of sparkle to an otherwise somber piece. Sloping down from both sides of the center are black enameled shoulders artfully accented by a pattern of alternating diamond and clover shapes. Don’t let the delicate appearance of this Victorian beauty fool you, it’s actually quite sturdy and able to be worn every day. Make it yours for just $1,350.00. There is no question that some of the most sought after pieces at Joden are rock crystal creations. 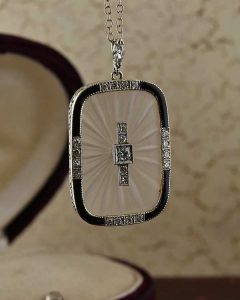 Whether they be bracelets, pendants, or even earrings – our customers go crazy for this classic Art Deco style. This pendant is sure to prove my point. 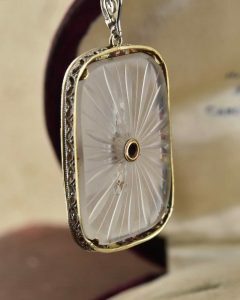 A cushion-shaped piece of frosted calcite rock crystal had been carved with a starburst pattern and artfully set in the center with a vertical line of five round diamonds. This beauty is further enhanced with a alternating framework of glossy black enamel and diamond set sections. The outer edge has been hand carved with an intricate scalloped pattern. 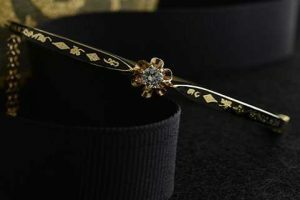 It is suspended from a simple bail constructed from a single marquise shaped diamond. It is effortless elegance at its finest. The moment this piece arrived at Joden, Joe scooped is up and whisked it away to his Special Box. Moderately priced at $1,750.00 – this is one gem that won’t last long. For this piece and so many fabulous others, like us on Facebook and follow us on Instagram. On Sunday morning, October 20th, 1839, John Gwynne bid farewell to his beloved wife of 26 years – Arabella. 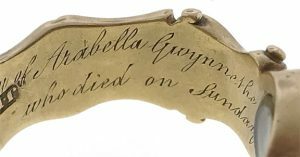 Sometime thereafter, he had this heartbreakingly beautiful memorial ring made for himself. 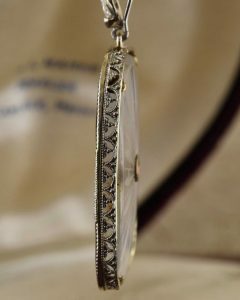 Each detail is a tribute to her life beginning with the hard stone cameo center. 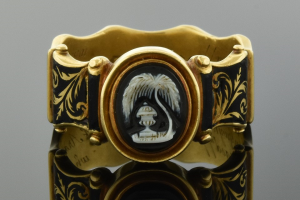 This small oval black and white agate has been hand-carved with a ceremonial urn sitting beneath a weeping willow – echoing the grief that John must surely have been feeling. 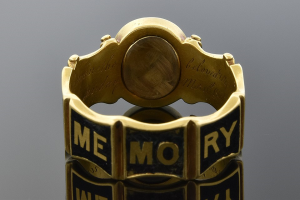 The segmented band of the ring bears the words “In Memory Of”… each bright yellow letter a sharp contrast to the matte black enamel background. Perhaps the most touching aspects of this dedication are on the inside – situated behind the center section is a hair receiver, carefully filled with a lock of braided chestnut colored hair. Engraved in two rows are these words: “In memory of Ararbella Gwynne the beloved wife of John Gwynne, Esq. who died on Sunday morn. Oct 20, 1839. Aged 77”. I can picture his wrinkled and aged hands holding her plait, and tenderly cutting a bit of it to be forever preserved beneath the glass. 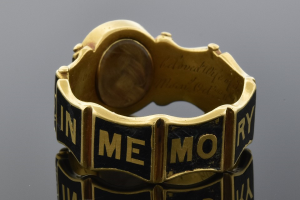 This is the only men’s mourning ring I have ever seen. I found it to be terribly romantic, so much so that I was inspired to do a bit of research. 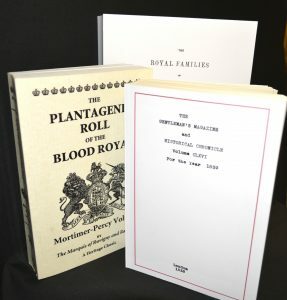 After many, many rounds of Google-ing, I was able to locate a trio of books as well as a website or two that list these two Plantagenets…. I uncovered three excerpts of interest (shown here… in the order in which I discovered them). I was both surprised and delighted to find any bits of information – imagine my excitement when I saw that John Gwynne is a direct descendant of King Edward, III! Royalty, indeed. I was also able to discern that they were married in 1813 – making Arabella a 51 year-old bride. Perhaps it was a second marriage, or perhaps she had waited all those years for true love. They had 26 years together. John passed 13 years after his wife in 1852. 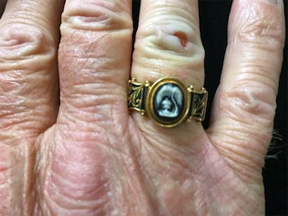 The ring is in quite good condition (especially for its age) – however, the enamel is chipped along the back side of the ring. I like to think its because it was worn… every day. And that it brought John comfort to know that part of Arabella was still with him while part of her was waiting… beneath the weeping willow. I hope you’ve enjoyed the story of John and Ararbella Gwynne as much as I enjoyed discovering it. 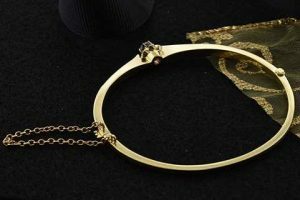 Come to Joden to see this rare royal treasure for yourself, and click on the newsletter link below to have Joden Girl delivered straight to your inbox.